1. Tuesday in Florence, SC - The Florence Civic Center is an excellent way to get in the mileage. Without too much twisting and turning, it's possible to add miles across the lot and around the facility. The bonus is that the lot is generally always empty, especially during the morning. The surface is flat and smoothly paved. The temperature in Florence this week was in the 80 degree range. Humidity must have been 90%. Less than a mile in and my shirt was soaked. By the final few steps, my shoes were squishy. I couldn't get enough water (hello to summer). And for the truly analytical of runners out there, the most logical route around the civic center is right at .40 miles. 2. Thursday in Minneapolis, MN - The Mall of America is also an excellent way to get in a different type of mileage. 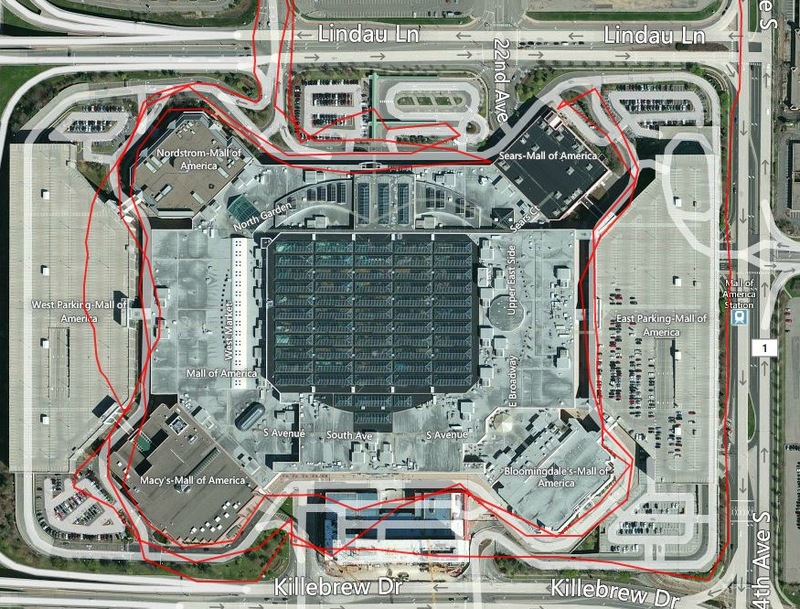 More about making laps around the mall, (which by way, is just over 1 mile at the shortest path), the M of A lot provides more rolling hills and the need to move across various surfaces. It's also advisable to keep a head's up, as even at 6 in the morning, there is plenty of activity around the mall. In terms of weather conditions, Minneapolis in May was a chilly 38 degrees and 0% humidity. Definitely more concern over frost bite than dehydration. In fact, I can't recall a single drop of sweat (of course, I was still in my shorts and short sleeve that I brought from Florence). Anyway, I think the moral to this post is that even as your training plan appears to have provided you with identical runs, it is the unexpected variation that helps to make them most memorable.